Mental illnesses are affecting several millions of individuals in the U.S and worldwide. Statistics have revealed that one among six adults in the United States is suffering from a mental illness with varying severity. Accordingly, mental illnesses are considered as one of the major factors behind the global disability as well as health and economic burden. The conventional treatments prescribed to treat mood and mental disorders are observed to show a response in only 30-40% of patients with major depression disorder (MDD). Besides, the serious adverse events associated with these treatments have also made it urgent for scientists and researchers to search for other alternatives to be used as monotherapies or adjuvants to conventional treatments. In this review, we have summarized a number of the most extensively-studied natural remedies indicated for the treatment of anxiety and depression. 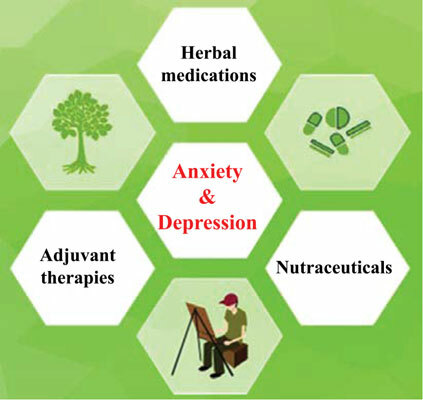 We have also included some of the common nutraceuticals used to treat both anxiety and depression, along with a number of the newly-emerged adjuvant therapies. Herbal medicine, Nutraceuticals, Anxiety, Depression, Adjuvant therapy, Mental illness.